A divorced couple's teen-age daughter stands trial for stabbing her mother's latest lover. Explores the relationships shared by the residents of a seedy boarding house in London. CinemaScope spectacularly spreads before you the velvet cape and violent age of Sir Walter Raleigh and The Virgin Queen. Queen Elizabeth I: There can be no funeral without a corpse. Truly a spectacular movie featuring a young Richard Todd and an even younger Joan Collins. 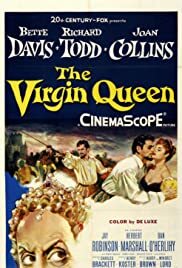 This movie is about a young man called Raleigh (Richard Todd) whoms biggest dream is to sail to the new world in search of treasures to help the English empire rebuild it´s glory days. Joan Collins plays the role of Bess Throckmorton a Lady of the court who fells in love with Richard Todd´s character Sir Walter Raleigh. The only difficulty is that her majesty the Queen played by Bette Davis also finds herself smittened by the mysterious Night.